Failing to score against a top-15 ranked Stony Brook defense in the first quarter, Delaware was not willing to spoil a rare promising drive. Positioned at the Seawolves’ 33-yard line, the Fightin’ Blue Hens opted to attempt a 4th-and-6 conversion. But the gamble proved costly. 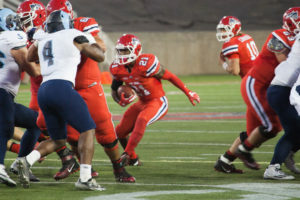 Junior linebacker John Haggart stripped Delaware redshirt sophomore quarterback Joe Walker of the ball, which was promptly recovered by senior defensive back Jaheem Woods and returned for a 55-yard go-ahead touchdown that established a 6-0 Stony Brook lead. Bolstered by seven forced fumbles, the most by any Football Champion Subdivision team this season, the No. 22 Stony Brook Football team defeated Delaware 21-3 at Delaware Stadium on Saturday afternoon for its third consecutive victory. Stony Brook remains undefeated in conference play at 4-0, now tied atop the Colonial Athletic Association with the No. 5 James Madison Dukes. And with four regular season games left to play, the Seawolves, 5-2 overall, are poised to eclipse five wins, the team’s win total for the past three seasons. Defense led the way with the usual pomp, limiting a Delaware team that averaged 270.8 rushing yards entering the game to 104 rushing yards, good for a mere 2.2 yards per attempt. Walker, the Blue Hens’ dual-threat quarterback, was held to a season-low 17 rush yards on 13 attempts to couple his 134 passing yards. Junior defensive back Tyrice Beverette, fresh off a CAA Defensive Player of the Week award, spearheaded the commanding performance with a team-leading 13 tackles, tying his season high. But it was Haggart’s night of glory. The Sayville native forced three fumbles, recorded three sacks and accumulated 11 total tackles, 5.5 of which were for a loss. Ahead 7-3 in the third quarter, the Seawolves attempted a fourth-down conversion of their own, with markedly better results. On 4th-and-13 from the Delaware 20-yard line, redshirt sophomore quarterback Joe Carbone skirted from a collapsing pocket and scrambled for a 20-yard touchdown run, his second rushing touchdown of the season. Carbone ended the night with six completions on 13 attempts, one interception and no passing touchdowns. Finding the endzone in his fifth straight game, redshirt junior running back Stacey Bedell accounted for all fourth quarter scoring. Met by a clogged line on a run to the left, Bedell switched fields, taking a 20-yard touchdown run down the sideline to extend his team’s lead to 21-3 early in the fourth quarter. Five minutes later, he solidified his team’s lead with another touchdown, his 10th of the season, via a 33-yard run. Bedell averaged an economical 8.6 yards per carry, needing just 14 carries to churn out 120 yards, including one 50-yard pickup. 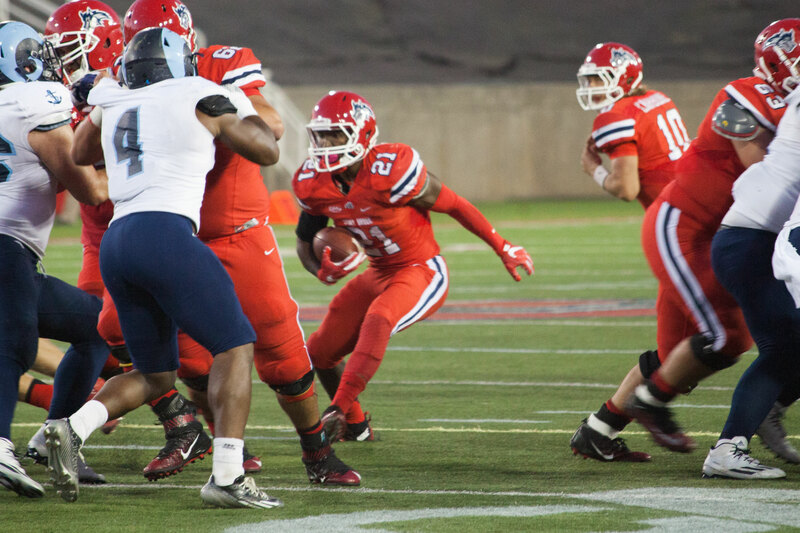 Conference and road play continues for the Seawolves, as they face the New Hampshire Wildcats on Saturday, Oct. 29 at Cowell Stadium. 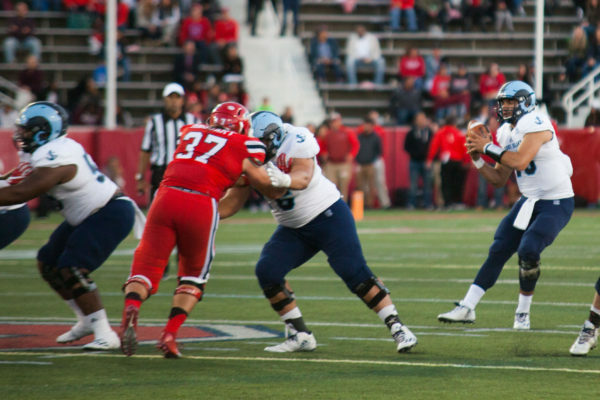 Last season, Stony Brook routed a favored New Hampshire team in a 31-6 upset.